The Pittsburgh Steelers defeated the Carolina Panthers on Thursday evening, 39-24 continuing the fourth full week of preseason action in the NFL. On the surface, Kyle Allen’s stat line, going 25-for-36 for 250 yards and a touchdown, looks impressive. However, he also got away with a number of poor throws that will be reflected in his PFF grade. Those throws included a would-be interception near the end of the third quarter, with the cornerback failing to control the ball as the only ground the only thing stopping Allen from taking an interception against his stat line. The Carolina defense looked lost at times in coverage, as they were frequently drawn in by play-action fakes only to leave wide receivers wide open for large chunk plays. The second half saw Steelers quarterback Mason Rudolph scramble to his right only for a Panthers linebacker to over pursue and leave his man wide open for a touchdown, summing up the night for the defense. Carolina’s pass-rushers played well and were able to get heavy pressure on the Pittsburgh quarterbacks. However, they were unable to convert those pressures into sacks. Pittsburgh’s receivers had no problem getting open against the Panthers defense. They did, however, have their fair share of missed opportunities due to drops. Wide receiver Tevin Jones had himself a game, scoring two touchdowns and making big plays in the passing game. Quarterback Mason Rudolph had no problem throwing the ball into tight windows, but his receivers struggled to catch the ball. His best throw came against a zone defense where he hit his man on a slant route between three defenders, only to have his receiver drop the pass. He had another sure touchdown right down the seam that was dropped. With roster cuts coming soon, three defensive players flashed enough as pass rushers to give the Steelers something to think about when decision time comes. Olasunkanmi Adeniyi was only on the field for a handful of snaps but still managed to record a sack and force a fumble late in the second quarter, after forcing a holding penalty just a few plays earlier. Outside linebacker Keion Adams was a constant menace, routinely being found in the backfield causing pressure, while Matthews Thomas produced the trifecta, registering a sack, forced fumble and recovery all on the same play to open the fourth quarter. Carolina: Allowing Thomas to force a fumble and flip field position to open the fourth quarter killed off any comeback hopes for the Panthers. 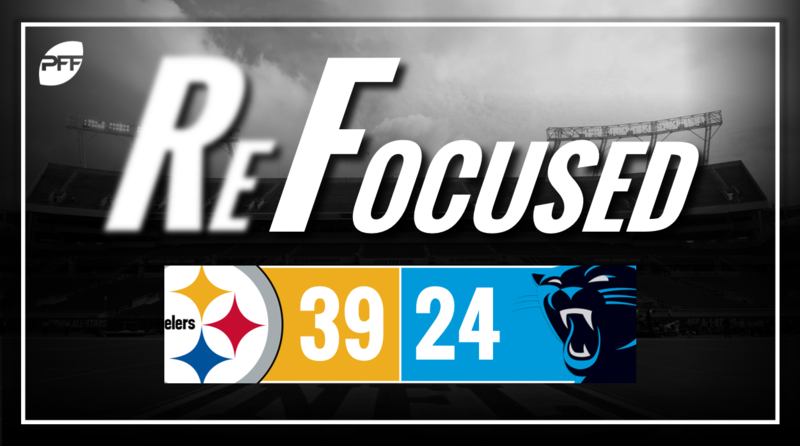 With the ball at the Steelers 19-yard line, the Panthers had a chance to reduce the deficit to two scores, but with Thomas not only forcing the fumble but returning it all the way to the Carolina one-yard line, the Steelers were able to score quickly and put the game out of reach. Pittsburgh: Quarterback Josh Dobbs was constantly making plays, escaping the pocket and finding open receivers. His night was highlighted by a magnificent pass against Cover-3 coverage, going over the safety for a huge gain. Dobbs led the Steelers offense to a quick lead early and never looked back.